As a registered 501(c)3 Non-profit Organization CHEER is here to strive for a better future. We are focused on creating programs that not only bring awareness to the CHEER causes but to plant the seeds of change in the minds of future generations. We firmly believe that through community partnership we can reverse the damage that has and is being done to our watersheds. Our ultimate goal is to reach a point where it becomes natural to care for your environment! Always remember this is the only planet we have!!! Ideas are always welcome, if you think you might want to partner with CHEER in creating a new program please reach out to Herman Garcia at (408) 497-3037 or Herman@CheerCentral.Org! The Coastal Watersheds Garbage Museum is CHEER's "Mobile Education Unit" that delivers interactive environmental education! The tour experience includes not only photos and text of the harm being done to our watersheds but provides 100's of garbage exhibits which our located on the museum itself! The museum consists of 3 stages known as The Walk of Shame, The Garbage Exhibit, and The Walk of Fame! During The Walk of Shame you will learn about the extensive damage being done from Monterey Bay to San Francisco Bay Watersheds! This includes examples of fish trapping, garbage dumping, and much much more! The second stage of the Museum tour is known as The Garbage Exhibit! As you take a walk around the exhibit you will see 100's of dumping samples found in local creeks and rivers! From automotive parts, furniture, to electronics you will always be surprised at the variety of items found on the exhibit! The final stage of the tour is The Walk of Fame! Now, you will have the opportunity to experience the positive outcomes from the hard work of CHEER volunteers and partners! Our volunteers work around the clock to reclaim and restore our watersheds and the surrounding ecosystems! These efforts also help protect the quality of our watersupply! CHEER partnered with The Green Education Foundation to bring the museum idea to reality! Working together CHEER and GEF are able to bring the museum to schools and events with NO COST! 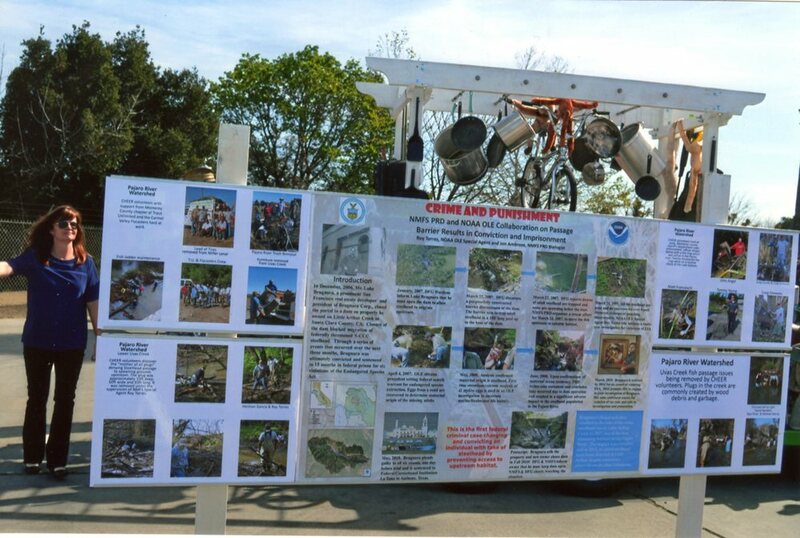 A bonus Upcycling/Recycling Exhibit is provided by GEF at the conclusion of The Walk of Fame! This exhibit provides information not only about how GEF is working on new ways to dispose of items, but ways you can Reuse Rethink Recycle at home before the thought of disposal! If you would like the museum to visit a school and/or event near you please contact Herman Garcia via (408) 497-3037 or simply complete the following fields! Throughout the year CHEER has many activities in which students of all ages can participate. These activities include: creek clean ups, fish rescue & restoration, non-native plant removal, native plant restoration and Garbage Museum volunteers! Students are eligible for community service hours required by the majority of schools. These hours go toward Student Graduation, Extra Curricular Programs and Internships! Hours can be accumulated individually volunteering or participating in a school scheduled group activity! AND MANY MIDDLE AND HIGH SCHOOLS! The harm being done to our local watersheds is happening at an alarming rate! Volunteer opportunities are available. These activities include: creek clean ups, fish rescue & restoration, non-native plant removal, native plant restoration and Garbage Museum volunteers! CHEER volunteers improve your water quality, boost the local economy, and sustain our natural resources through their hard work. If you would like to volunteer or find out about upcoming events such as clean ups please complete the form below. We are constantly discovering new projects and all help is appreciated. If you would like to receive a phone call rather than e-mail please include your phone number in the "Message" section of the form. We are always excited to see the new people that these projects and causes bring! Thank you! You will be hearing from us!